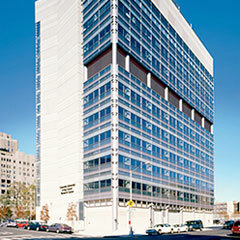 Located in northern Manhattan, Herbert Irving Comprehensive Cancer Center (HICCC) is Columbia University’s structural organization for the conduct of transdisciplinary research programs and excellence in patient care. As such, HICCC’s history of cancer research has been recognized by the National Cancer Institute (NCI) as one of a select group of comprehensive cancer centers in the United States. In fact, it’s received this designation for more than 30 years. In partnership with New-York Presbyterian Hospital, HICCC patients are provided a team of internationally renowned experts who create personalized treatment plans that address the physical, social and emotional needs that accompany the side effects of cancer procedures such as surgery, radiation and chemotherapy. Each year the hospital treats more than 3,500 cancer patients. Patients receive treatment at the Mesothelioma Center within HICC at New York-Presbyterian Hospital and Columbia University Medical Center. The Mesothelioma Center at Columbia provides innovative diagnostic procedures and top-notch therapeutic care for patients with pleural or peritoneal forms of the disease. In fact, about 100 newly diagnosed patients from all over the nation are cared for at the university’s Mesothelioma Center. Columbia University’s Mesothelioma Center benefits from the expertise of medical oncologist and hematologist Robert Taub, M.D., director of the program. He takes special interest in the diagnosis, clinical care and study of malignant mesothelioma. In fact, he is the principal investigator of three asbestos cancer-specific clinical trials being performed at the Herbert-Irving Comprehensive Cancer Center, each open until 2013. Two of these studies explore the effectiveness of different chemotherapeutic drugs for previously treated patients or patients with unresectable mesothelioma. The third trial examines the protocol of combining surgery, chemotherapy and radiation therapy as treatment for pleural mesothelioma patients. Another physician with clinical asbestos cancer expertise is Igor Matushansky, M.D., within the Division of Hematology/Oncology at Columbia University. Mesothelioma patients may also benefit from the radiation oncology ward, home of the nation’s largest and most experienced research center for radiation biology. They offer multiple forms of external beam radiation therapy, where radiation is delivered from a source outside of the body. The radiation oncology department also offers brachytherapy, a form of radiation favored for its ability to spare healthy tissues from exposure to powerful radiation. HICCC’s clinical approach to approach to treatment is influenced by on-site research performed by a team of 200 physicians and laboratory assistants. HICCC has received nearly $95 million in funding for peer-reviewed cancer research and is fully prepared to treat any mesothelioma patient. New York-Presbyterian Hospital is ranked first in the New York Metro Area and sixth in the nation on U.S. News and World Report’s 2011-2012 Best Hospitals Honor Roll. Disclaimer: Presbyterian Hospital Columbia University Medical Center has no professional affiliation with Asbestos.com.